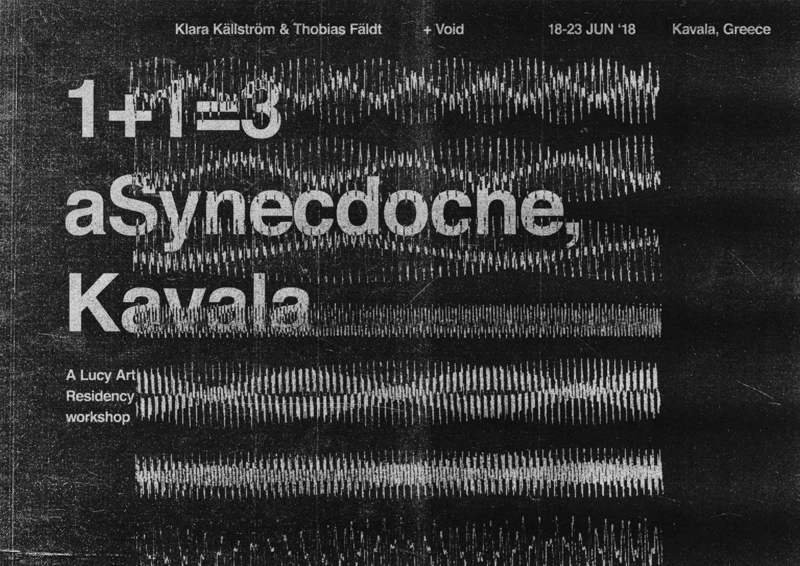 As part of the expanded Lucy Art Residency events program, artists Klara Källström & Thobias Fäldt will join with Void on a 5-day workshop in the Greek city of Kavala. Phase 1 – Tutored by Klara Källström & Thobias Fäldt, the participants will work on researching and producing a photographic project in Kavala. Klara & Thobias will work with the selected photographers on how to approach and deal with the discrepancy of the “Visible and the Spoken”, introducing them into how to approach this concept and how to use it as a primordial soup and help new forms emerge in photographs, narratives and ideas. Phase 2 – Tutored by the Void team, the participants will produce a book dummy from the imagery produced on the first days. The idea is to take the narratives and concepts explored with Klara & Thobias into the concrete object realm: the book. Edited, designed and bound from scratch, a dummy will be produced and presented to the public during the Lucy Art Residency Talks on the last day of the workshop. The ultimate aim of the 5-day workshop is to span the execution of a photographic process from its seed theoretical perspective, to the concrete workmanship final form of a book making. Working on all façades of the photographic narrative: from the concepts and questions raised before the shutter is even pressed, to the sequencing and design of a publication. Our goal is to have a group of both locals and visitors to the city, as one of the purposes of the workshop is to pair and confront distinctive views about the same subject: the attached and knowledgeable view of those who are familiar with Kavala and its stories vs. the visitors’ gaze and their new perceptions and paradigms. Neither are true or false, right or wrong. And we believe this workshop will help to build, in a proportion of 1 + 1 = 3, the best result out of it.